Ian Sheldon, economist with OSU's ag college. RAVENNA, Ohio — Farm profitability could remain low and decline even further if tariffs on trade remain in place beyond the current growing season, an ag economist told farmers and conservation leaders at the annual Portage Soil and Water Conservation District banquet Sept. 13. Ian Sheldon, an ag economist with Ohio State University’s College of Food, Agricultural and Environmental Sciences, said U.S. farmers are “caught in a crossfire” that could only get worse. He is also the Andersons Chair of Ag Marketing, Trade and Policy at OSU. “If the U.S. leaves its tariffs in place and China continues to retaliate with its tariffs, farmers are caught in a crossfire through no choice of their own, at a time when they’re suffering from low farm incomes, and I think this has the potential to create serious economic harm for the ag sector,” said Sheldon. The tariffs ultimately make U.S. farm products less attractive and less competitive in the world market. Currently, Brazilian soybeans are selling for about $10.18 a bushel, and U.S. soybeans are selling in the Gulf for only $8.50, as a result of the tariffs. This spring, the Donald Trump administration put tariffs on Chinese aluminum and steel, to combat intellectual theft, but China responded with its own tariffs on American farm goods, and the two countries have ratcheted up their rhetoric and policy all summer. Sheldon said part of the reason for low U.S. crop prices is undoubtedly due to high yields. However, he pointed out that China is the top foreign customer for U.S. soybeans, and that in Ohio, about a third of all beans get shipped to China. Last year, Ohio alone exported about $1.8 billion worth of soybeans, with one-third going to China. “That’s a pretty significant market, both at the state level and obviously at the national level,” Sheldon said. If the Trump administration continues down the same path, Sheldon expects farm income will continue to decline and the wedge between the price U.S. farmers and Brazilian farmers receive for beans will continue to widen. For an average farmer who farms corn and soybeans, he estimates farm income could decrease by 59 percent over the next several years. Sheldon said the government has stepped in by announcing a $12 billion trade aid package, but he said without the tariffs, the aid would not be necessary. He said farm and commodity groups across the state are worried that losing trade with other countries could take a long time to restore, and rightfully so. “It’s extraordinarily hard to get that market share back,” he said, pointing to the scares over mad cow disease, and other world events, which took many years before markets were restored. 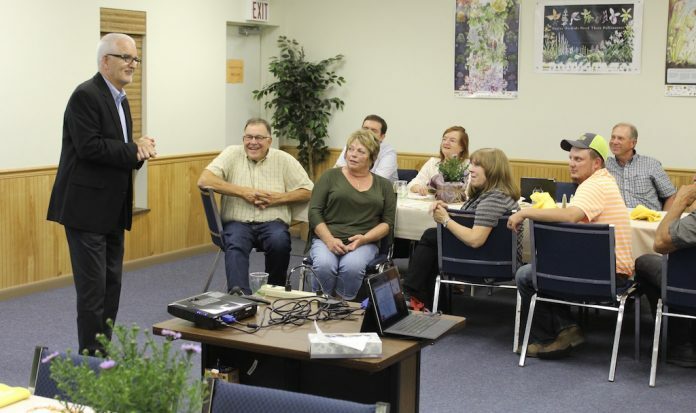 Sheldon admitted his talk was a bit “doom and gloom,” but it seemed to resonate with area farmers, who said his assessments were accurate of what they’re seeing at the farm level. 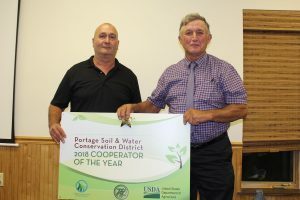 Prior his speech, Portage SWCD District Coordinator James Bierlair presented the Cooperator of the Year award to Dennis Wise, a 29-year board member who helped keep the district going during thick and thin. Portage SWCD’s James Bierlair (left) presented the Cooperator award to Dennis Wise. Bierlair said Wise helped keep the office open and vibrant, even during a time when staff and budgets were being cut, and that Wise was a driving force behind the county’s farmland preservation efforts. Wise is a third-generation farmer with a little more than 219 acres enrolled in the state farmland preservation program. He is also a long-time supporter of on-farm conservation practices, like grassed waterways and buffer strips, which he installed on his own farm 30 years ago. Wise is believed to be only the second board member to have served consecutively for more than 25 years. Also at the meeting, the county elected Zach Alger and Tony Heppe, for board positions that begin in January. The Communists have been thieving ALL of our most valuable technology. How else to stop it other than making them feel some economic pain? Things will work out in the long run. Always have–always will.